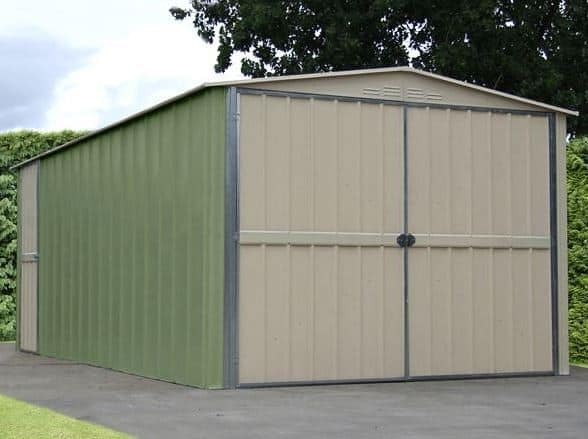 This fantastically large 10 x 19 apex metal garage has tons of space inside. This means you can store vehicles or heavy machinery with ease. The apex roof is a real treat, offering a little bit of extra head height as well as providing plenty of protection against the rain. The 20 year anti-rust and perforation guarantee is also a massive benefit; particularly if you are storing metal items. A high tensile steel build, ventilated gables and reinforced huge metal doors help to give this garage excellent value for money. This is a popular large metal garage from the StoreMore Canberra range. Built with exceptional quality and providing a massive amount of internal space, the garage comes with a great apex style roof. This design focuses on water resistance, as well as providing a nice attractive addition to the building. One great advantage of the apex roof is the fact it supplies a lot more internal space. 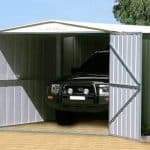 Due to its shape, it offers extra height in the central part of the garage, making it suitable for taller vehicles and equipment. Measurements for the building include a roof height of 2.03m and an eaves height of 1.77m. It is the depth that is most impressive, measuring 5.88m, while the width stretches out over 3.07m. The doors of this building are particularly large, measuring 1.68m high and a fantastic 2.60m wide. Strong, vertical style metal cladding is used throughout the building’s construction. It has a unique design that looks great in any garden. Thanks to the superb 3 coat paint finish, the exterior of the building is properly protected against the weather all year round. It is extremely rust resistant and also comes with the added benefits of being rodent and fire resistant too. The frame is built with galvanised hot dipped steel, supplying remarkable strength to the entire building. 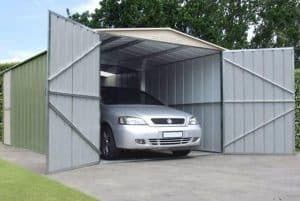 This gives you excellent peace of mind that your car will be completely safe and even high winds won’t pose a problem for this garage. 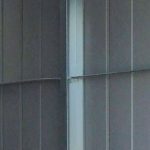 The metal has also been dipped in zinc to ensure it is fully rust-resistant as well as protected against water. One important thing to note is that this garage doesn’t come with a floor. 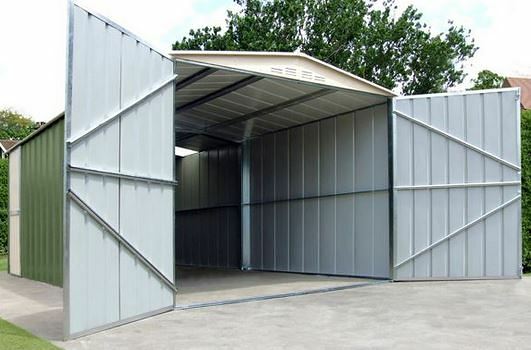 This is actually a great advantage as it ensures you don’t have to worry when storing heavy vehicles or machinery. However, what it also means is you will need to built the garage on a concrete surface. Considering its size this may be a problem for those who don’t have much concrete space. You could of course invest in paving slabs, but considering the initial high cost of the building, this wouldn’t be a good option for those on a budget. We love the fact this garage doesn’t need treating. It is designed so that it fully withstands all weather conditions without the need for preservatives, paint or treatments. A large reason for this is its 3 coated paint finish, offering an exceptional waterproof barrier. As the manufacturer is so confident with the quality of the building, it even offers a superb 20 year warranty against rust and perforation. As mentioned earlier, this garage comes with two very large, heavy doors. They open up extremely wide to ensure you can easily get your vehicle in and out without problems. However, what we really like about this garage is the fact it comes with an additional third door on the side, providing easy and quick access. It is also worth mentioning that the doors have been reinforced to provide excellent security and stability. Like others in the range, this building doesn’t have any windows. This would present potential issues regarding natural light if the garage wasn’t equipped with an integrated skylight. Of course, this won’t help at night or on dark winter mornings, but an electrical pack can be installed if you plan on using the garage as a workshop. You also don’t have to worry about ventilation as the company has also ensured the building has ventilated gables. 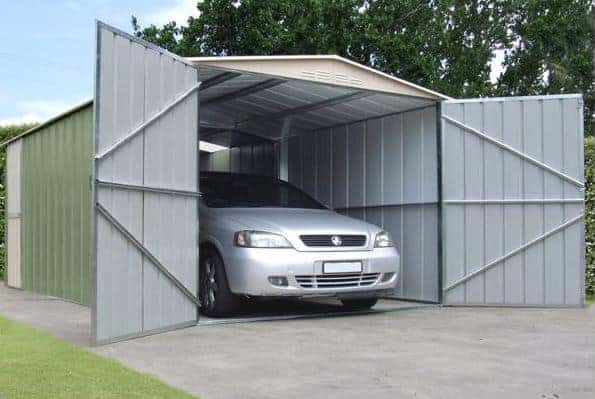 You can’t find a much more secure and private garage than this one. It’s extremely tough exterior acts as an excellent theft-deterrent. Combined with the strength of the high tensile steel frame, it is exceptionally difficult to break. The doors being reinforced also provides fantastic security. Then you have the windowless design. If you have an expensive vehicle this is a particularly reassuring feature. Once the doors are closed and secured, nobody will be able to see what type of vehicle is being stored in the garage. This is also advantageous if you’re storing expensive tools, equipment or machinery. 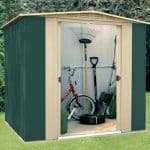 The Storemore metal shed anchor kit is the only extra you could really need. Helping to fix the base to the overall structure of the garage, it provides exceptional stability. Of course, without the anchor kit the building is already really secure thanks to the heavy galvanised steel framework. However, the anchor kit basically gives you a little more reassurance; particularly in blustery weather. It also helps to make the entire structure more stable so that’s a pretty big benefit. Like all buildings created by Storemore, this garage has a fantastic, high quality design. It’s reassuring to know that you are investing in a building that is guaranteed to last for many years to come. 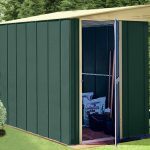 If you’re looking for a garage that will withstand the elements and provide excellent durability for years to come then this is a good model to opt for. 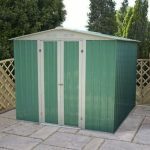 It comes with surprisingly good durability, with the galvanised hot dipped steel offering a particularly long life span. 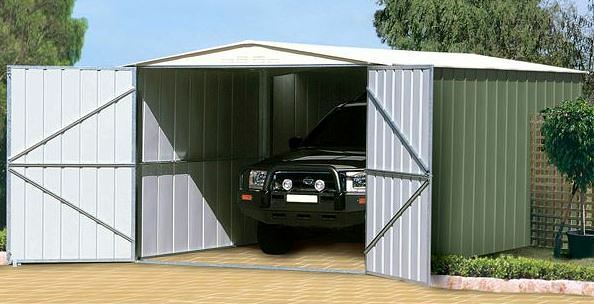 The size of this garage is incredible and it should easily store a large vehicle. If using it as a workshop, you also have the option to install shelving which gives you even more storage potential. Installation is often one of the main concerns when you buy a large outdoor building. This garage isn’t overly difficult to construct, but it will take a significant amount of time to put together. Don’t expect to build it in half a day. The actual assembly process is easy enough, it’s just the heavy work and time involved that lowers its rating for us. As with all the large buildings in the Storemore Canberra collection, this one does come at a high cost. However, if you’re looking for value for money this building does provide it in bucket loads. 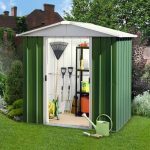 It’s extremely long-lasting, is especially hard to break into, requires no additional money to be spent on maintenance and it supplies a huge amount of storage. Final Thoughts: This is one of the most impressive garages we have had the pleasure to review. 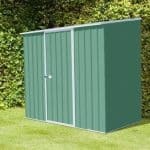 We love its strong, secure build and the fact it has been constructed with hot dipped galvanised steel. We also love that it doesn’t need annual maintenance. Whilst installation is time consuming, the end result is absolutely fantastic. 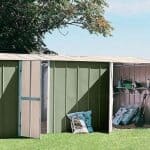 So if you have the space and the initial budget, this garage does provide good value for money and is a worthwhile addition to the garden.